How often have you heard the expression ‘authentic’ used; and how often have you sighed in disappointment? In the case of Markree Castle near Cooloney in Co. Sligo this will not happen as the recent restoration bringing this spectacular castle back to its original grandeur has kept as true as possible to its original origins. Naturally there are modern conveniences that the original builders would have incorporated, had these inventions been around in those days. We are talking about the early part of the 19th century so Markree Castle comes with turrets, towers and other idiosyncratic adornments. This stately pile includes the ultimate manifestation for a wealthy owner – its own private Chapel, located inside the Castle. Markree Castle was in the Cooper family since it was built in 1802, but just recently was sold to another family, the Corscaddens. They are building a reputation as custodians of several Irish castles, breathing life back into our rich architectural heritage. 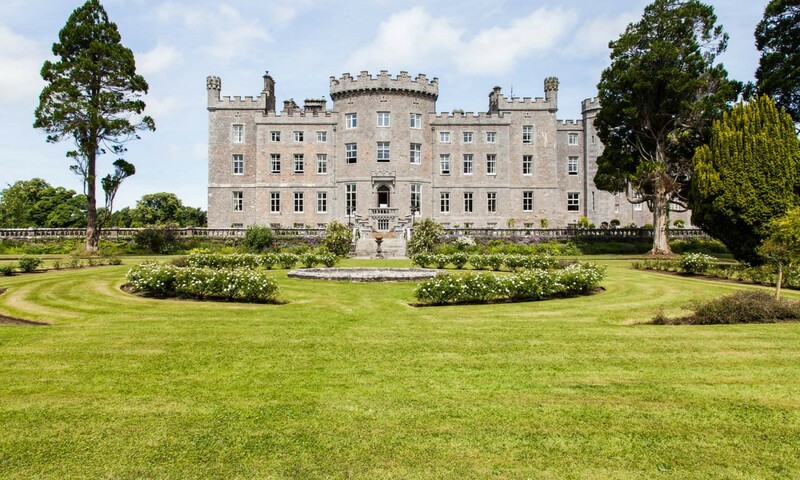 Markree Castle is in safe hands and now a jewel in this crown of Romantic Irish Castles. We were invited for a special night of hospitality so lots of entertainment was laid on for the invited guests. We began our visit with a walk around the grounds, bordered by the River Unshin. The grounds are splendid and typical of the ‘Big House’ with extensive parkland, flower beds and box hedges. The trees have not been cataloged so I was put to the pin of my collar figuring out ages and species. Many of the trees are ‘ent like’ so I couldn’t resist the odd hug here and there. There are two groves where the trees initially grew horizontal to the ground before turning their heads skywards; tree climbing children growing up in Markree must have had a ball in these gardens. Jason Deasy, a local Falconer, gave a superb demonstration of his birds of prey flying hither and tither across the gardens. The art of Falconry dates back thousands of years so it was really fascinating to see them in full flight in such an appropriate setting. It was clear that the relationship between Jason and his birds was special and the displays by Yoda, Indigo and Phantom were breathtaking. More entertainment was provided before dinner with singers Sophie and Laura O’Keeffe, known as Kudos. I expert we will hear a lot more about this talented pair in the future. The architecture of this Big House has many interesting features. The rear facade of Markree Castle is symmetrical but not so the front. The location of the entrance is to one side and a reminder of the life these wealthy owners led as occupants of carriages were protected from the elements by an elegant porte-cochère. 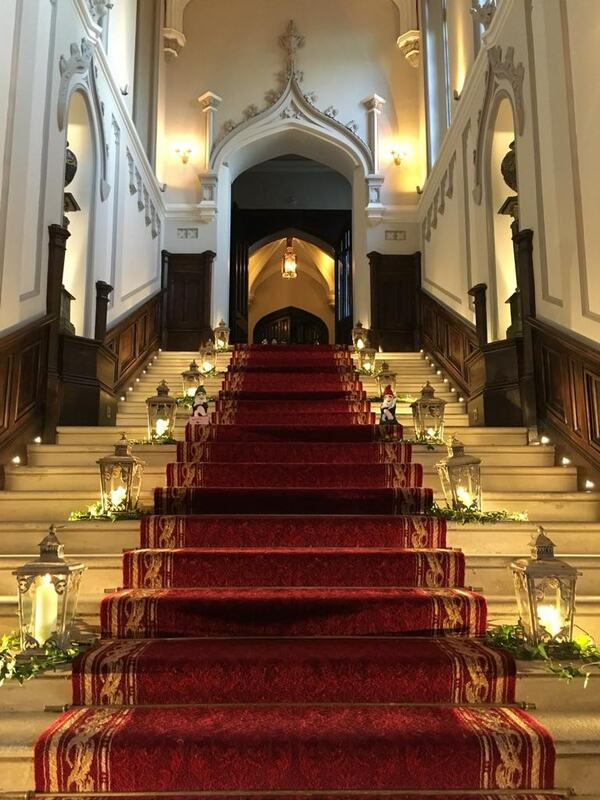 The handsome entrance stairs is captivating and this alone would be enough to have brides choose Markree Castle for their special day. On entering the Grand Hall everything becomes even more majestic. It would take chapters to write about each splendid room, one more imposing than the next. 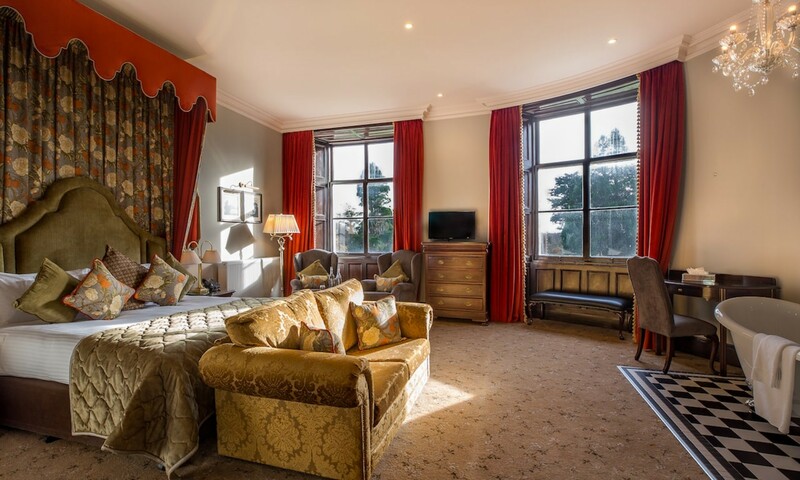 The restored cantilevered staircase showcases a stained glass window with hundreds of years of history revealed through the lineages of those featured therein, including King Henry VIII and the original owner of Markree Castle, William Cooper. 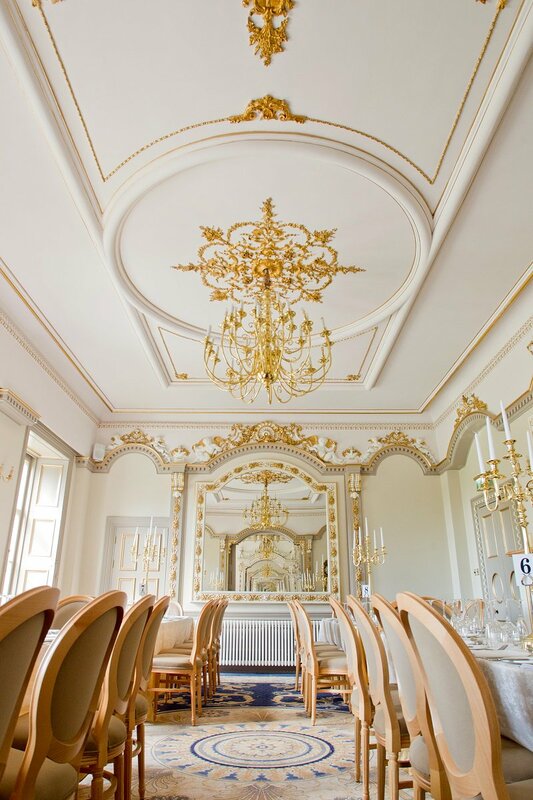 The Dining Room presents an immense amount of gold leaf latticework and decorative cornices. I smiled when I noted the putti angels wearing gold cross body sashes to preserve their blushes! Guests are spoilt for choice when it comes to finding a favourite place to relax. You would need several days there to immerse yourself in the Markree experience. There is the Observatory, which is a striking Drawing Room on the first floor with windows on three sides. 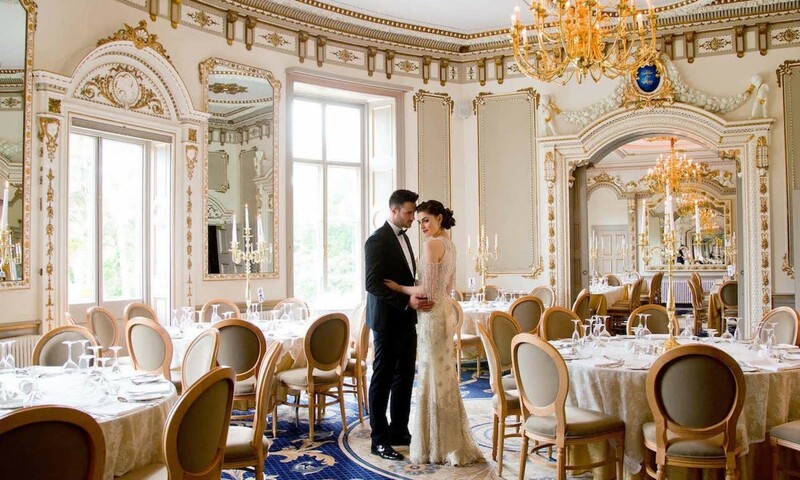 There are three magnificent Reception Rooms linking to the Grand Hall; Corinthian marble columns add to the sophisticated elegance. Pappy’s Bar is yet another discreet Drawing Room and ensures that fun can be had without disturbing sleeping guests. A full sized snooker table takes pride of place on one of the landings. Despite walking the length and breadth of the Castle I fear that I might have missed one or two of the myriad of nooks and crannies. There are 31 bedrooms in Markree and we were allocated No. 18 for our stay. Whilst this was a small sized room it was nicely furnished. The bed was ultra comfortable. It had a good sized bathroom with walk in shower and Voya toiletries. This is an excellent local brand and good to see support for these products. The most unusual feature of the room was the adjoining tiny turret with its arrowslit windows and large roll top bath. The basement level is given over to entertainment with Buttery; Drawing Rooms; Dance floor and Bar. The vaulted ceilings give it a spacious feel and what a place to hang out at a wedding. Markree Castle specializes in exclusive weddings and has to be one of the best wedding venues in the country. Atmosphere is created not just by surroundings but by the people who occupy it. Howard Corscadden and his sister Patricia have given charge of the running of this establishment to Nicholas and Deirdre Ryan who have been in situ a short time but who personify courtesy and professionalism. In recent years I have noticed a trend among some hospitality marketing executives of aloofness which they wrongly believe signifies sophistication. It was therefore very refreshing to meet Sharon O’Donoghue, the bubbly Marketing Manager for the Romantic Castles of Ireland. Sharon clearly loves and believes in what she is marketing and is a great ambassador for the hotel group. Lee, who is the chef at Markree Castle knows what he is about and our meal that evening combined a delectable fish course of monkfish, scallops and mussels all caught locally. This was followed by Black Angus fillet of beef which was exquisitely complimented by a lobster spring roll and carrot and tarragon puree. Dessert was a mouth watering Chocolate Mousse with pink peppercorn shards. Markree Castle has a lot to offer its guests. For a Big House it is warm and welcoming. There are Neolithic tombs and dolmens to explore nearby, including the magnificent Queen Maeve’s cairn on Knocknarea mountain. Those who feel more contemplative might enjoy visiting W. B. Yeats’ grave. 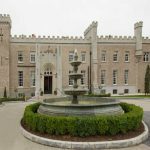 Markree Castle fits in perfectly with this historic region and is now creating a new narrative for the 21st century.